This past weekend Nikki and I picked up a bunch of beautiful organic red leaf lettuce at the local farmer’s market. It’s our go to leafy green mostly because it’s super versatile. You can add red and green leaf lettuce to a smoothie, make it the base of your salad, and goes what? The individual leaves also make an awesome taco shell! 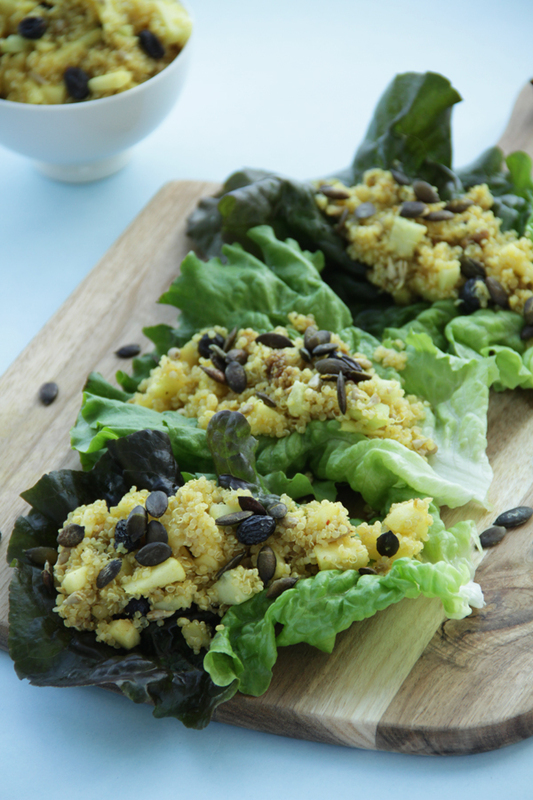 This time we decided to fill them with Apple Quinoa Salad drizzled with Curry Citrus Dressing . We loved it! It’s crunchy, sweet, satisfying and pretty easy to make. You should try it! Really! Now place the lettuce on a cutting board and cut the bottom part. Separate leaves and pat dry with a paper towel. Set aside. Preheat oven to 375 degrees. Spread almonds and pumpkin seeds on a baking sheet; toast in oven until lightly toasted and fragrant, about 7 minutes. Let cool; coarsely chop nuts. Rinse quinoa thoroughly; drain. Bring 2 cups water to a boil in a medium saucepan. Add quinoa; return to a boil. Stir quinoa; cover, and reduce heat. Simmer until quinoa is tender but still chewy, about 15 minutes. Fluff quinoa with a fork; let cool. Whisk together maple syrup, shallot, curry powder, salt, and lemon juice in a large bowl. Season with pepper. Whisking constantly, pour in oil slow,; whisk until dressing is mixed in. Add quinoa, mulberries/cranberries, apple, seeds and nuts; toss well. 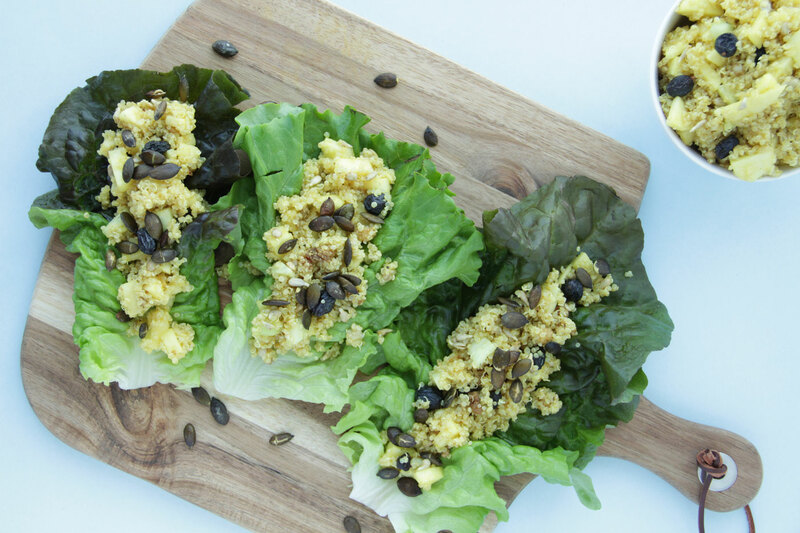 Fill each lettuce leaf with about 1/4 cup of quinoa salad and you got yourself some pretty delicious and healthy tacos! 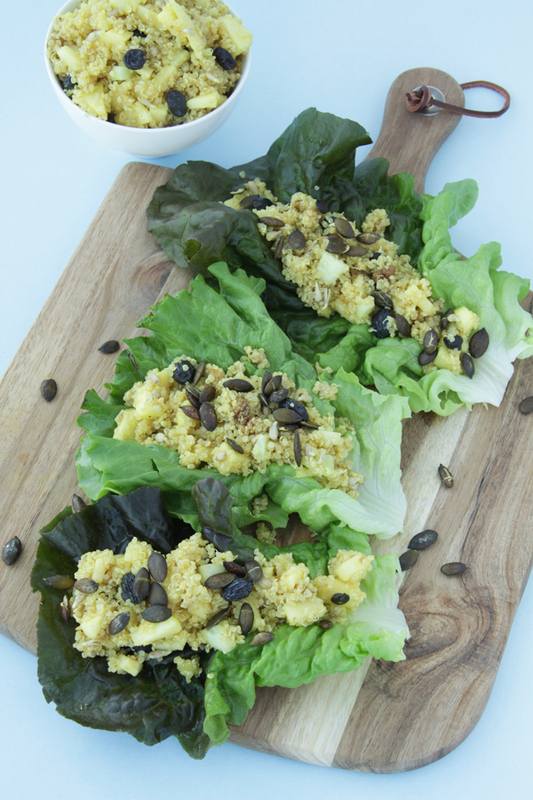 The quinoa salad stores well in the fridge for up to 3 days and it's really tasty just on it's own. Now, let’s eat some beautiful food that tastes good, doesn’t hurt anybody, and makes the planet happy. Those don’t look like collards, that’s swiss chard, right? Yes in the picture we did use Swiss chard however either will work for this recipe. In your book you mention a video showing a collard leaf wrapping technique that is supposed to be on your site but I’ve searched high and low and I can’t find it. Have you posted it yet? Yes indeed. 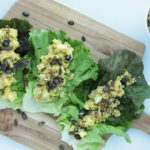 Here is a quick video on how to make “collard wraps”. You can use a collard wrap just as you would a tortilla, filling it with whatever you like.